Ford R. Bryan, an indefatigable researcher and facile writer, has a wonderful knack of delving into the nooks and crannies of Henry Ford's multi-faceted life. The 55 chapters of Friends, Families & Forays are bursting with details about the people and the pursuits that colored the life of Henry Ford. Here the reader will meet prominent and diverse figures such as Thomas Edison, John Borroughs, George Washington Carver, Helen Keller, and Mahatma Gandhi—all of whose lives intersected that of Henry Ford at some interesting point in his life. Also brought to life in these pages are the branches of Ford's family tree, from his Irish ancestors to the descendants who carry his legacy today. Although it was the automobile that made him an industrial icon, Henry Ford could boast of exploits in many other arenas as well: railroads, speedboats, robots, flour mills, rubber plantations, and humanitarian efforts around the world and in his own backyard. Ford's hard work and passionate interests brought him great wealth , and this book provides a peek at the luxuries he and his wife, Clara, enjoyed, from a yacht and a private rail car, to gracious residences in Michigan, Florida, and Georgia. Ford Bryan, who lives in Dearborn, Michigan, has written five other books about Henry Ford, including The Fords of Dearborn, Henry’s Lieutenants, Beyond the Model T, Henry’s Attic, and Clara: Mrs. Henry Ford. 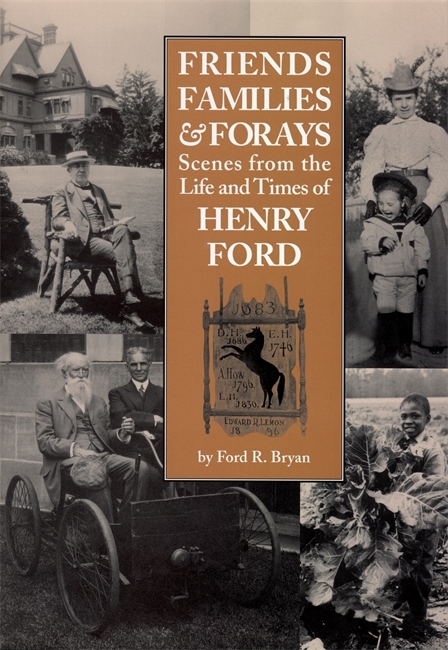 For those of us with an insatiable appetite for any information relating to the life of Henry Ford, Ford R. Bryan has once again written a fascinating book. We are all indebted to Mr. Bryan for the lifetime that he has spent documenting the many sides of Henry Ford not commonly known to the general public and rarely described in written form."